The remains found by the Royal Malaysian Navy (RMN) are not those of a USS John S. McCain (DDG 56) Sailor. On Aug. 22, the RMN discovered the remains while searching the area where the guided-missile destroyer collided with a merchant vessel. The determination was made following medical examinations of the remains, which will be returned to Malaysian authorities. 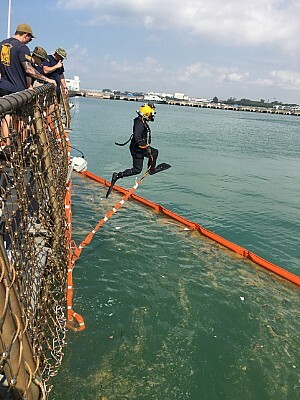 Additional divers from the 15th Marine Expeditionary Unit arrived in Singapore to support search efforts within the ship. Multinational search efforts continue at sea over an area of approximately 900 square nautical miles around the initial location of the collision. Indonesian Navy ships joined the search and rescue efforts this morning. KRI ships Barakuda, Pulau Rusa, Cucut, and one NV 409 helicopter are approaching the area. A Royal Australian Air Force P-3 maritime patrol aircraft also joined search efforts. Assistance from the Royal Malaysian Navy and Republic of Singapore Navy continues with RSN ships Gallant and Fearless and RMN ship Leiku. The four Sailors who were injured and flown off the ship to a hospital in Singapore were released yesterday and have returned to the command. “Adm. Scott Swift, commander of U.S. Pacific Fleet, today relieved the commander of Seventh Fleet, Vice Adm. Joseph Aucoin, due to a loss of confidence in his ability to command. “Divers have found remains of missing American sailors in the flooded compartments of the Navy destroyer John S. McCain, which collided with an oil tanker on Monday off the coast of Singapore, the commander of the United States Pacific Fleet said Tuesday. The commander, Adm. Scott H. Swift, did not say how many bodies had been recovered from the ship, which is docked at Changi Naval Base here. He also said that the Malaysian Navy, which is part of the search effort, had reported recovering a body at sea that might be one of the 10 missing sailors. Aircraft from the amphibious assault ship USS America (LHA 6) will continue search efforts Aug. 22 for 10 missing Sailors assigned to the guided-missile destroyer USS John S. McCain (DDG 56). Ships and aircraft from the Royal Malaysian Navy and Republic of Singapore Navy joined search efforts Aug. 21 and continue to provide assistance. Search efforts are focused on an area east of the Straits of Malacca and Singapore where McCain was involved in a collision with the merchant vessel Alnic MC early in the morning on Aug. 21 (as reported 6:24 a.m. Japan Standard Time) while transiting to Singapore for a routine port visit. During the collision, John S. McCain sustained significant hull damage that resulted in flooding to nearby compartments, including crew berthing, machinery and communications rooms. Damage control efforts by the crew halted further flooding at sea. John S. McCain and America arrived at Changi Naval Base in the afternoon on Aug. 21. While both ships are in Singapore, America is providing messing and berthing services to John S. McCain crew members and supporting damage control efforts on board which are focused on dewatering the ship and restoring auxiliary systems. Ship Repair Facility divers have commenced assessments of the hull as well. Search and rescue efforts continue in coordination with local authorities. Royal Malaysian Navy ships KD Handalan and two coastal patrol craft Petir (12) and Pang Alang (39) as well as two Malaysian Maritime Enforcement Agency vessels are on scene. Republic of Singapore Navy Fearless-class patrol ships Noble Pearl (PCG 54) and Noble Knight (PCG 56) joined search efforts as well. A Navy official told CNN the McCain was fighting flooding in several places and that it had limited propulsion and electrical power. The Navy said the McCain was steaming under its own power to port. In addition to the 10 missing sailors, the Navy said five were injured in the collision. Search and rescue efforts are under way, the Navy statement said, with helicopters and Marine Corps Osprey aircraft from the amphibious assault ship USS America responding. Singaporean ships and helicopters were also responding, the Navy said. Initial reports indicate the US ship sustained damage to its aft port (rear left) side, the Navy statement said. It did not give information on the status of the merchant vessel. 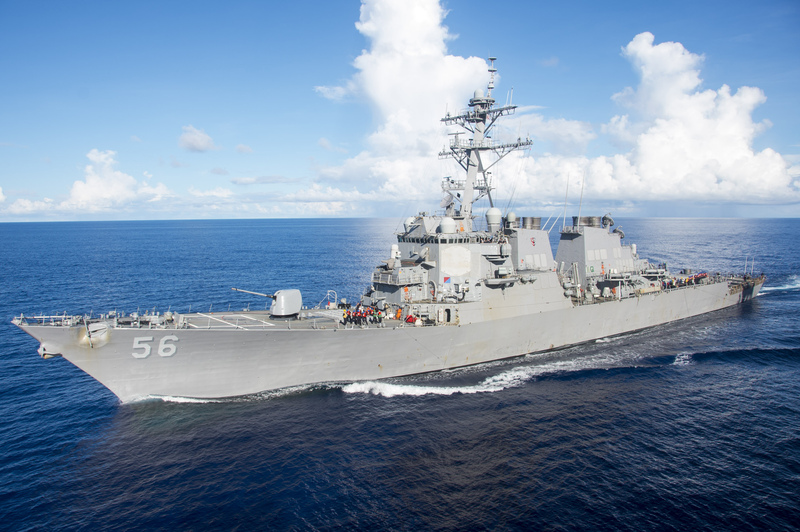 The guided-missile destroyer USS John S. McCain (DDG 56) was involved in a collision with the merchant vessel Alnic MC while underway east of the Straits of Malacca and Singapore on Aug. 21.